As part of the expansion and renovation of the Livingston Campus dining hall and dormitories, Rutgers University identified an opportunity to showcase innovative green infrastructure BMPs. 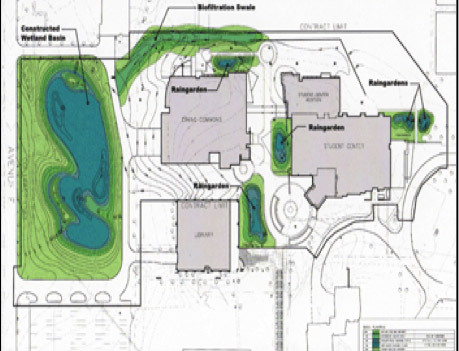 The BMPs work in an integrated fashion to meet both the immediate stormwater management needs of the dining hall/dormitory project and future planned campus development. Also, in keeping with Rutgers University’s sustainable design initiatives, the stormwater management system not only meets regulatory requirements but also sets the example for all future stormwater systems implemented throughout the university. To mimic the natural environment, the green infrastructure-based design integrated into the stormwater management system the natural properties of the adjacent Kilmer Woods nature preserve. This approach essentially brought the nature preserve back into the campus, making it a focal point of the site. The project began with the removal of a 10-acre parking lot. 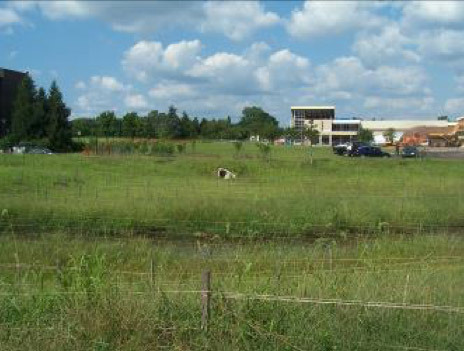 Subsurface investigations were conducted, stormwater runoff was modeled and natural landscapes were designed within the proposed stormwater basin and rain gardens. This included the creation of a floodplain basin with riparian forest plantings and vernal pool habitat. Drainage of the basin into the receiving stream system was accomplished by the construction of a vegetated swale, designed to mimic an intermittent stream that only flows during rainfall events. 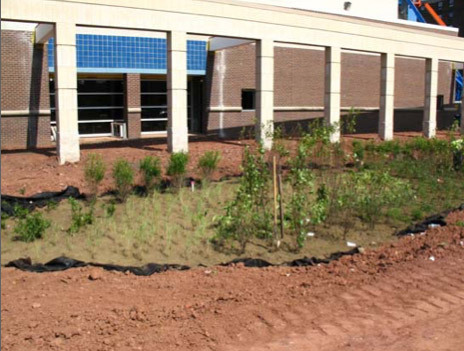 In addition to the primary stormwater management facility, several smaller rain gardens and “pocket” bioretention areas were integrated into the pedestrian walkways. These smaller features manage runoff close to the point of its generation and create public education opportunities.